Welcome to Concept Dental Clinic, a state of the art dental facility in Prince George. I am exceptionally proud of the leading edge technologies that we provide to help ensure that you receive the best diagnosis and treatment available to you in the field of dentistry. With state of the art x-ray technologies, a Cone Beam 3D imaging machine, and Surgical Microscopes in every workroom you can be assured that every procedure will be done in the most efficient and gentle way possible. My philosophy is to present my patients with the "best" options for their treatment and, very importantly, I will provide alternate options. Dentistry is more than a job to me. Since graduating from McGill University I have continued to study specialty areas of dentistry that have held my interest. I have taken extensive courses concerning the Temporomandibular Joint (TMJ) that has such a profound impact on both general and cosmetic dentistry. I am passionate about cosmetic dentistry and the positive impact it can have when we can help to create a beautiful smile. If you are interested in cosmetic dentistry I encourage you to visit our "Smile Gallery" online or come into the office to view other examples of our work. I am a member of both the Canadian Academy for Esthetic Dentistry and the American Academy of Cosmetic Dentistry. I am very proud of our staff, their relationships with our patients and their dedication to continually upgrading their knowledge as dental professionals. I know that, when you visit us at Concept Dental Centre you will be sure to agree. Concept Dental Centre strives to provide the best in new technologies for its patients and x-ray technology is no exception. Digital radiography is used to capture the x-ray images that will inform your treatment, giving Dr. Rickards many advantages not available with traditional film. Not only will the amount of radiation required be reduced by nearly 80%, but images are immediately available for viewing, with images directly transferred from the sensor to the computer monitor. Images can be enlarged on all side chair computers where you can view the images with the doctor as a part of your dental experience. In cases where a referral is required, images can be sent by e-mail to the required specialist. The newest piece of technology at Concept Dental Centre is the Cone Beam 3D Imaging Machine which allows the traditional Panorex X-ray to be taken using lower radiation than ever before. It also offers the ability to capture 3D images of any area or tooth in the mouth, allowing more information to be captured than ever before. For our patients who have a sensitive gag reflex (gaggers), or a very small mouth (children), this machine can make their lives much easier. 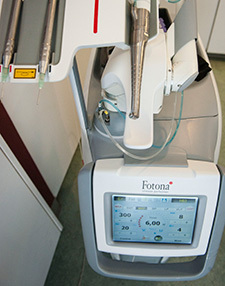 The Cone Beam 3D Imaging Machine has the ability to take traditional bite wings films without the sensor being placed in the mouth. "From a treatment standpoint, this 3 dimensional view allows me to avoid complications from unseen or unusual anatomy that was not suspected which would not be visible on a 2D x-ray. I use this extensively for implants, extractions, root canals and tricky diagnostic situations. It allows me to provide safer, more predictable treatment for our patients." This is another very exciting piece of technology. It allows us to take dental impressions without having to put that "gooey stuff" in your mouth. It is also exceptionally accurate. At concept Dental Centre we have 4 different laser systems. Each one operates at a different “wavelength” which means they “see” or treat different tissues. There is a 980nm diode, a 1064 & 2940nm (Er.yag) laser, as well as a Low Level Laser Therapy System (LLLT). This means that there are a great many procedures that can be performed on tooth, gum and bone that have greatly improved healing times and comfort levels. In the last 20 years lasers have shown a lot of promise for use in dentistry. As a matter of fact, Dr. Rickards had the first Er:yag laser in Canada in the late nineties. Unfortunately, the technology was not reliable enough at that time. However, things have changed dramatically since then and as a result we have recently acquired the latest, state of the art dental laser system. Lasers do not replace all of our drills and tools and while there are times when using the laser is superior to the drill there are other times when the opposite is true. Suffice it to say that at Concept Dental Centre we want to be sure that the optimal equipment is available for every treatment – whether for patient comfort, healing or overall treatment success and experience. Conducting preventative gum procedures that may eliminate the need for more invasive and expensive gum surgeries. Removing bonded porcelain crowns safely and easily remove without damaging them. 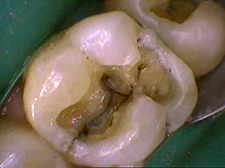 In some cases, fillings without anesthetic. Performing minor surgeries without bleeding and supporting faster healing. Performing the PIPS technique for root canals, a revolutionary new way of dramatically improving the ability to clean the canals in a root canal procedure. LLLT is another technology Dr.Rickards brought into the office at Concept Dental to better take care of our patients. Primarily we use it to reduce inflammation ( jaw joint muscle problems) or speed up healing in any of our surgical cases ( extractions, implants or gum procedures). This is done at no additional cost to patients, only to improve patient outcome. The Piezo Implant and Surgery Centre is a piece of equipment that fits extremely well with our philosophy of safety and comfort for our patients. 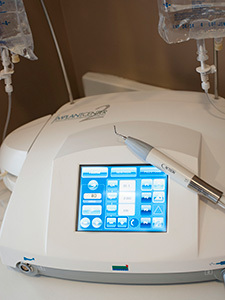 Dr. Rickards uses the Piezo Unit for virtually all implant and oral surgery procedures. It is interesting to note that this technology does not do anything that cannot be done with conventional tools. The equipment's value is in the things that it does NOT do. For example, in surgeries and implants when you are near fragile structures such as nerves, blood vessels and sinuses conventional tools can cause damage when coming into contact with these structures unintentionally. The Piezo Unit allow us to work safely in these sensitive areas because it can do efficient surgery on bone, but will not cut into soft tissue. This piece of equipment is used for virtually all implant and oral surgery procedures. "I realize that this may be a bit technical, but I want my patients to know that I am always looking for the best ways to take care of them. I sleep better at night this way!" This impressive technology shows incredible detail. It allows us to take an image, so you can see what we see.